The memories from my childhood always brings a smile… even when I got into trouble! It was hard as a kid to find people who were poorer than us. But then there was my friend Maggie. Her family had been roaming Gypsies for many years until they came to our town. The Council promptly put them into a little house two blocks away from ours, a box where they growled and snarled like wild animals, drinking themselves into oblivion and fighting the pain of imprisonment with fists and raucous swearing. To me, Maggie was an exotic traveler with her accent thick as buttermilk. We quickly became friends using our girlish imaginations to transcend our poverty. We found diamonds on the road (broken glass) and saw ourselves wearing ball gowns with roses on them, (Maggie would always say the word Roses with a rounded fat tongue with her Romany brogue). We scoured old houses for secret passageways secretly hoping for buried treasure to help us become princesses like in the story books we read so the ball gowns would become a reality. Our school was in the middle of town, walled in from the garish noise of passing traffic. It was an emerald oasis set into the dirty grime of rainy streets. 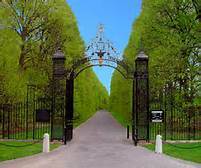 The gardener always had the ornamentally scrolled main gates open for the children in the morning, Fir trees lined the path to the little school, shielding a forest deep and mystical. Needles had fallen for many years blanketing the roots. Silver, silken threads of sunlight laced through the leaves, pointing to shy Snowdrops looking down at the sparkle on the snow. Come late spring the sun spotlighted an orchestra of Bluebells laughing and tinkling in the breeze. Mother Nature caressed all the senses on that path from the school to the gate, nourishing the souls of two little girls who didn’t have as much as a blade of grass between them. So… It was a powder puff of a summer day and we were on our way home. 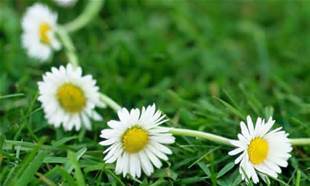 We looked under each Daisy for a fairy kissed flower for our chain. My Granda told us that when a fairy kisses a Daisy it blushes pink under its petals. Granda was old and wise, so we knew it must be true. I bit into a hairy stem to make a hole and was nimbly threading a flower through when I heard, “C’mon, Teresa!” “Maggie squeezed her greasy mop of ringlets through a hole in the wire fence, the back of her sweater catching on a loose wire. “Hang on a wee minute,” I said reaching over to untangle her, her unwashed smell like warm mice wafting up. In seconds she was through the hole, knees crisscrossed with grass and a grubby hand wiped the drip from her nose and down the back of her skirt. Maggie gestured wildly; I hesitantly followed this warrior into the School Garden. Rustle, rustle, a skinny leg with a gray ankle sock scudded through the limbs, 6 or 7 green apples came thudding onto the grass. Wiping the waxy skin on my sweater I picked one up and took a deep crunch. “Holy Heavens”, I exclaimed, my eye quivered and my face scrunched into a sour pucker. “Good, eh?” Maggie asked and jumped down beside me proceeding to stuff them into her knickers, keeping one in her hand she nibbled patterns in the skin. I gingerly placed 4 into my underwear and out we scrambled. Skipping and holding hands and swinging on each other’s schoolbags we were trying to finish the apple neither wanting to be the one to give up. And I had always wanted to be tough, like Maggie. Around the corner came the gardener, his tweed cap pulled over bushy eyebrows, big square head lost in a furrowed neck. “Isn’t it funny how both our Mammy’s gave us apples for lunch?” Maggie trilled cheekily. My piece of apple was stuck in my chest and the cold fruit in my underwear was starting to feel awful heavy. At last he was past- but, we had only just started to breathe and we were hoisted by our schoolbags in the opposite direction. This caused the last of the apples to ping out of the elastic of our knickers and roll right onto his feet. With one huge, hand he bustled us back to the Main House, keeping the evidence in his pockets. Our feet never met the ground as he hauled us away all too quickly in front of the Principal, the dreaded Mrs. Laverty. She came down the hall, swooping like a vulture, her hair unfurled like a black sail. Her pearl beads were clicking in time with our chattering teeth. Mrs. Laverty approached; I could feel her anger. I couldn’t look up into her face, the heat in my body bristling the hairs on the back of my neck. I fixated on her pointy shoes where a hole had been cut to release her painful bunions. Teresa and Maggie you should both be ashamed, stealing! I want you both to bring in 5 pence tomorrow for the poor babies. “Her words punctured the thickness of our fear. I could feel the warmth of Maggie’s arm against mine, moral support stopping me from falling over. Then to go home, the terror of it made our steps leaden. The fright was intensifying with each step towards home. Maggie’s house was first and her Granny was sitting with a beer bottle on her lap, her legs wide open showing the long baggy drawers over wrinkled thighs. Maggie looked at me ruefully and stepped over Granny to get in the house. At my house I was sure mammy knew I was lying as I fabricated a story..
“Yes, we need to bring in 10 pence tomorrow for the poor babies, “I lied to my mother. I knew Maggie wouldn’t get her 5 pence so I had doubled up my payment for the stolen apples so she wouldn’t get into trouble. My mother didn’t hear about this story until I was married and out of her house. She would have given me a really hard smack even as an adult for that lie! Maggie and I grew apart when we moved to the Big School, a red bricked monstrosity on the other side of town and Maggie was put in another class. I still look for fairy kissed daisies in my adult life, they are all over the world .It gives me hope that magic is to be found if you just know where to look. I love the story. Thanks for sharing!